This recipe is probably how we really think of meatballs, Italian style, served with pasta. I’m not sure Mum would have put the olives in as she and Dad didn’t like them, but I think they are the ingredient that makes the Italian difference. 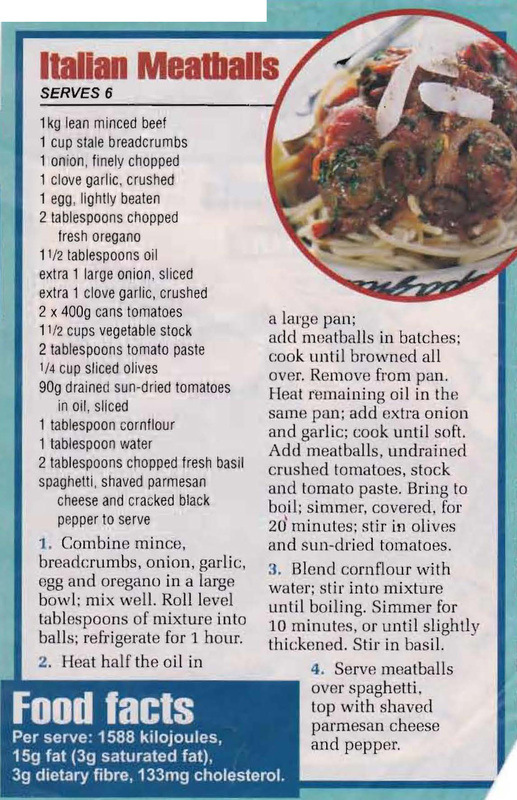 This entry was posted in All Recipes, Beef, Main Dishes and tagged 1990s, garlic, Italian meatballs, minced beef, olives, onion, oregano, parmesan cheese, sun-dried tomatoes, tomato paste, tomatoes by bebsrecipes. Bookmark the permalink.